Originally published as a Limited Edition print in 1988, Low Holding Over The San Jacinto remains one of Robert Taylor’s most sought-after pieces. 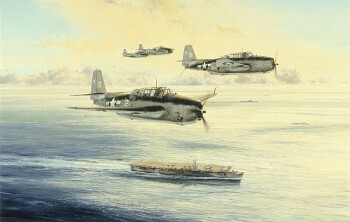 The image portrays a scene from August 1944 with Lieutenant (JG) George Bush as part of a four-plane formation of TBM Avengers from Torpedo Squadron 51 (VT-51) flying a low-holding pattern in preparation for landing aboard the carrier. The edition was personally signed by George H W Bush and, needless to say, copies of that original edition are extremely rare and highly sought-after. 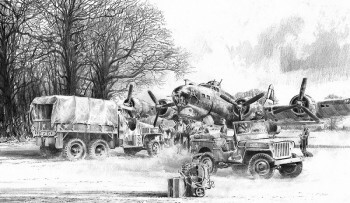 Now, thanks to the latest high-definition technology, this wonderful image is available as part of Robert Taylor’s hugely popular series of artist-signed giclée canvas proofs, creating the look and feel of the original painting. Completed in his trademark technique of using a mixture of graphite with subtle colour highlights, Richard pays tribute to this legendary aircraft by depicting two famous variants: TORNADO INTERCEPTOR features an F3, the fighter version and TORNADO FORCE shows GR4s, the multi-role configuration. 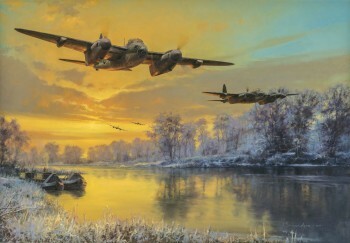 This highly detailed and carefully researched painting by James Dietz, one of America’s foremost military and aviation artists, fittingly depicts this famous unit to represent all those who served with Bomber Command during World War II. The crews have just returned safely to RAF Scampton after a long, hazardous raid over enemy territory. Tired, weary and thankful to have made it back in one piece, they can at last stretch their legs and enjoy some welcome refreshments before heading off to de-brief and a much-needed rest. 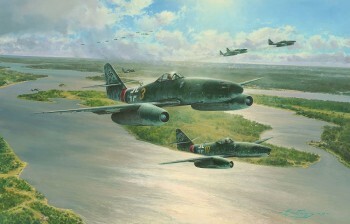 As with many of Robert’s early and long sold-out editions, the prints have been signed by an astonishing collection of Luftwaffe veterans which is now impossible to replicate. 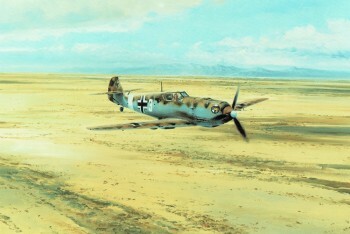 Included is the legendary Eduard Neumann himself, along with Aces who flew in combat with him in the Western Desert, creating a historic collector’s piece that is destined to become an instant classic. 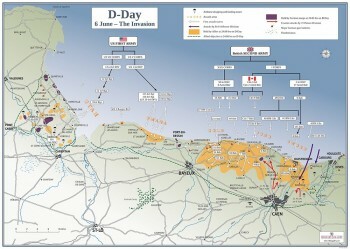 To commemorate the centenary of that November Armistice, Richard Taylor has created a moving tribute to all the Allied soldiers who took part in that epic struggle. 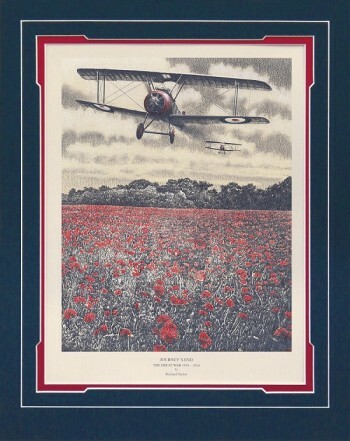 Fittingly, as an acclaimed aviation artist, he has chosen to do this with a powerful drawing that offers us a glimpse of one of the many aviators who pioneered a new form of warfare that, in the end, helped bring about final victory.